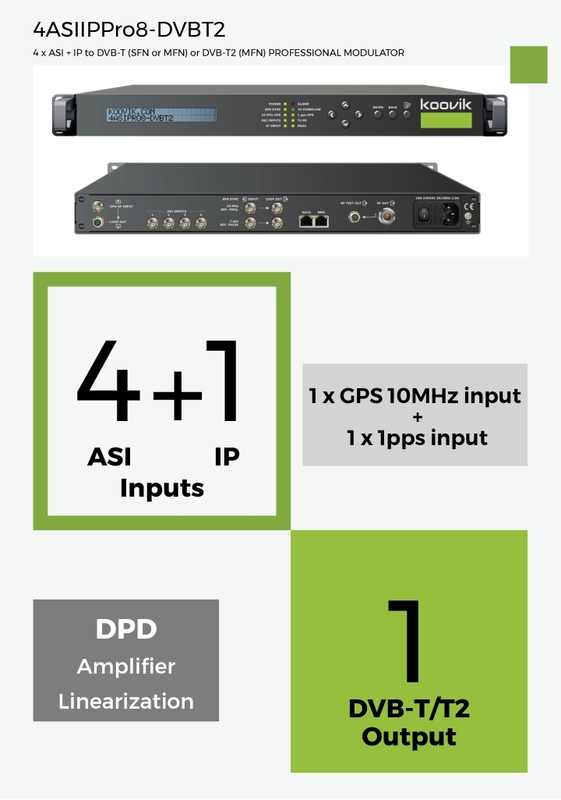 1 x RF input for Digital Pre Distortion (DPD). Constant Temperature Crystal Oscillator (Stability 0.1ppm). IP IP SPTS and MPTS. UDP UNICAST/MULTICAST. Max. 100Mbs. Reference frequency 10 MHz, 0.1 V to 5 V (Vpp) or TTL, BNC FEMALE. INPUT AND LOOP OUTPUT. Reference pulse 1 pps (1 Hz, TTL), BNC FEMALE. INPUT AND LOOP OUTPUT. IP MPTS 1 MPTS over UDP or RTP/RTSP. Unicast or Multicast. Max 100 Mbs. FREQUENCY 30 to 960MHz, STEP: 1 Hz. included 1 x mains cable, 1 x ground cable. 2 x BNC male to BNC male.